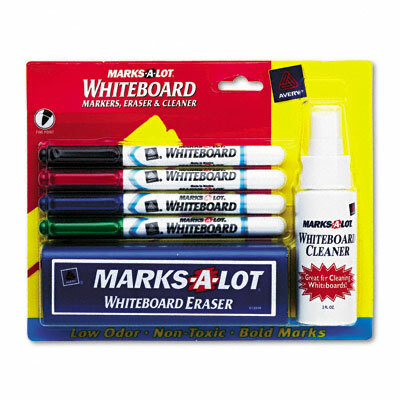 Kit features fine point dry erase markers ideal for writing details in small areas. For all whiteboards and other nonporous surfaces like laminated planners and calendars. Vivid colors wipe off easily with a dry cloth or eraser. Low odor and nontoxic; ACMI certified (conforms to ASTM D 4236). Package includes a 2 ounce bottle of whiteboard cleaner and a whiteboard eraser. Kit features fine point dry-erase markers ideal for writing details in small areas. For all whiteboards and other nonporous surfaces like laminated planners and calendars. Vivid colors wipe off easily with a dry cloth or eraser. Sturdy pocket clip for portability. Low odor and nontoxic; ACMI certified (conforms to ASTM D 4236). Package includes a 2 ounce bottle of whiteboard cleaner and a whiteboard eraser.